If you haven’t already, I highly suggest you head back to Part 4 and peruse the symbolism from episode six. It not only aides in switching the thematic focus from sexual discrimination to racism but is also an extraordinary look at what symbolism is capable of doing. Today, we’ll be going through just episode seven. This episode gives us development for both Kureha and Ginko while simultaneously providing us with a better understanding of racism, religion, and remembrance. While not as strong as the previous episode, it still has a lot to say in regards to the underlying themes it presents. -Explanation: Part of what makes symbolism so intriguing is how many connections can be made, and whether or not said connections are intentional. This symbol is a perfect example of this conundrum. 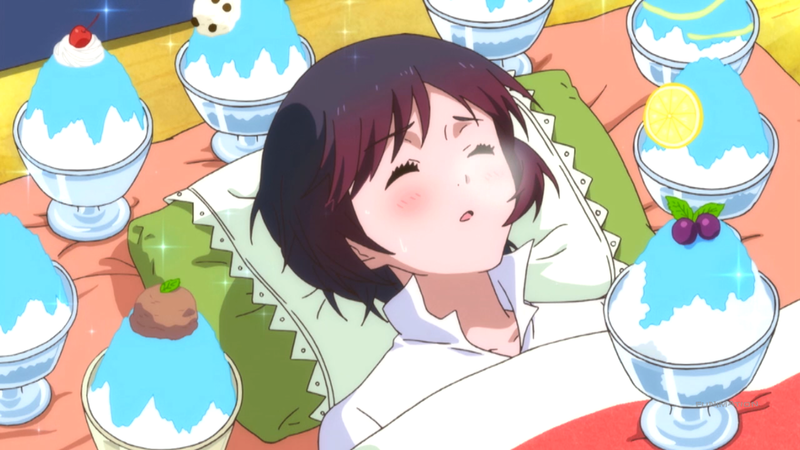 Ginko is surrounded by shaved ice. And on the four visibly-topped servings are four different offerings: a lemon, a grape, a basil leaf, and a cherry (starting at the top-right, moving clockwise). Just after this scene follows Ginko’s rather harsh and nearly unforgiving past, but remarkably (coincidentally? ), it’s already been given to us. So what we are given is an idea of what Ginko’s past was filled with: an overabundance of religious influence, an overwhelming lack of love and loneliness, all of which is backed by abuse, hatred, and death. This is exactly what the anime then proceeds to show. Are such findings logical? Can all of this really be intended? Or is it all just happenstance? It’s hard to say; it seems like tiny, insignificant details yet everything fits almost too perfectly to be ignored. Remember, though, the window and the toolbox of Kureha’s house; ice, lemons, and grapes did not have to be chosen. But they were, lending credit to the argument that, like most everything in Yuri Kuma Arashi, they symbolize something important. -Explanation: At this point in the anime, we’ve seen a lot of flowers, usually all of one type: the lily. But here we have a reference to a more obscure one, the wolfsbane. When it comes to symbolism and its uses, one of the most general and therefore the “easiest” to use and interpret are flowers. Their vastly varying shapes, sizes, and colors give them a wide range of applications and meanings to use in wildly different scenarios. It should come as no surprise, then, that Yuri Kuma Arashi follows this same sentiment. We’ve discussed at length the lily: it is purity, love, and homosexuality incarnate. Here, wolfsbane (or aconite) is symbolic of misanthropy. “Misanthropy” just means a hatred for humankind – or in context, a hatred for humankind and “bearkind,” or in some sense a form of racism. In other words, Ginko is not only alone due to the other bears’ treatment of her but also of her own inner despising of others. Kureha’s house is a literal flower garden: her chandelier is made up of purple tulips, with purple representing royalty (she is the princess “Moon Girl”) and tulips representing love. The rest of the house is splattered in other flowers pertaining to love: chrysanthemums, roses, myrtles, etc. Many of these are painted pink or red, which further adds to the already established ideas of love and passion. -Explanation: Large tanks, ditches, and snow are strewn across the battlefield. The bodies of the bears and the guns of the humans, who all lost their lives, litter the ground in an amalgamation of death. 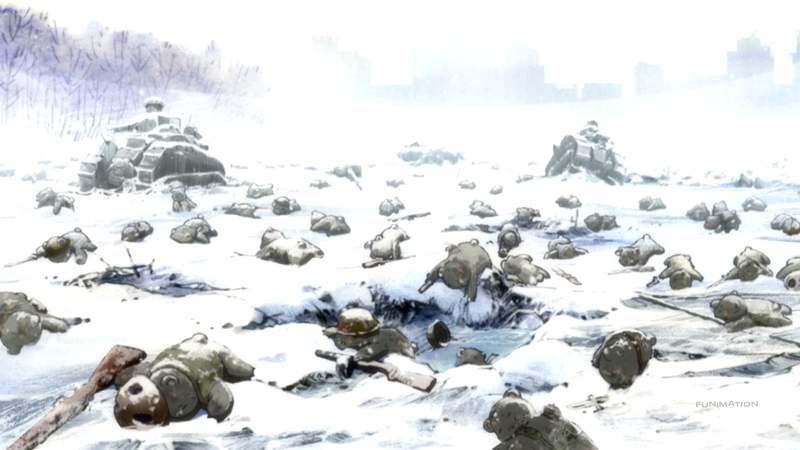 It’s an apt depiction of war, showcasing with ease such brutality – despite the bears’ general cuteness. This symbol is doing a lot of work (per usual) by utilizing similarities and information obtained prior. There are essentially two sides to the fighting: the humans and the bears. The humans’ motivations for squaring off against their adversary are somewhat puzzling, if almost unclear or unexplained. At the minimum, we know they are defending; the bears are attacking, so it makes sense that the humans protect themselves. Whether or not they’reencroaching is difficult to say, but remains a possibility. On the opposite end, though, it is quite evident why the bears are attacking. Many of them, including Ginko, have been gathered due to being “unwanted” or “unloved” their whole lives. So what they receive is a religious ordinance, a divine mission, a holy path to follow. They’re indoctrinated into believing that, should they murder the “vermin” that are humans, they will therefore obtain the love from the only person who can (to them) seemingly give it: Lady Kumalia. And again, this is quite interesting, because it is something we have already been seeing with the humans. The humans exclude the “weak,” and partake in religiously linked actions of their own. What this implies then is that the humans and the bears are practically the same. They’re “excluding” both each other and their own, they’re motivated by some unknown force, and their endeavors in the war presumably lead to nothing but death. In the end, the main reason for killing one another comes down to race. The bears are killing humans because they’re humans and the humans are killing bears because they’re bears. And with this, the anime begins looking at its next form of prejudice: racism. This switch isn’t sudden; it was precluded by the dual-symbolism of episode six – the first half of the show focused on homosexuality, the second half will focus on racism. There is apparent overlaps between the two, but this rift, this wall, in direction is erected now, not only within the actual story’s timeline but also in the overarching narrative. In short, using religion and “excluding” as support for the idea, the war symbolizes how asinine racism can be. Racism – or any form of prejudice – is bloody, nonsensical, and unforgiving, with the only conclusion to such a warring nature being not love, but freezing sadness. -Explanation: By now, one may be starting to “see” where a lot of the symbolism goes with Yuri Kuma Arashi. This one is easier in terms of scope, but provides a nice talking point to jump off of. Deconstructing what makes up the actual symbol involved, what is given is: honey, ginger, and milk. Food has already played its own symbolic role in quite a few instances, and it doesn’t stop here. Milk and honey together are, like many of the other symbols, commonly attached to a religious and sexual example. Here, in the biblical sense, “’milk and honey’ [is] a metaphor meaning all good things – God’s blessings” and was said to “flow or gush” in a sexualized manner. On top of this, ginger is most often associated with love and success , correlating easily to the broader ideas at play. In this way, Kureha’s and Ginko’s “flavor” that is honey ginger milk can be viewed as a drink that is both rich in preordained guidance and natural love. 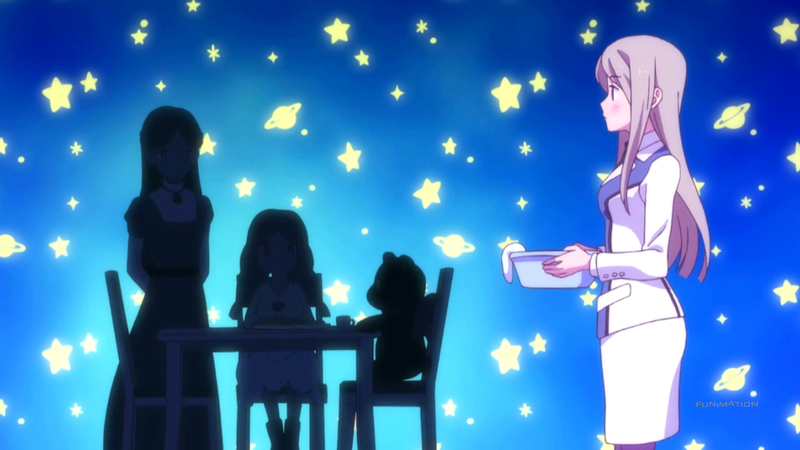 Before moving on to the next episode, this is the appropriate time to talk about Yuri Kuma Arashi’s use of flashbacks. We’ve seen this story tactic being used nearly constantly throughout the show. Kureha does it here with the honey ginger milk, much of Sumika’s moments are done through flashback, and even Lulu’s origin is done entirely through this technique. There is no escaping the flashback in this anime, and perhaps you are already desensitized to its prominence. As with everything contained within the show, it’s important to question it. Why are flashbacks used? And more importantly, why does Yuri Kuma Arashi use them? A flashback isn’t something newly invented. In fact, it is a device used quite often in many works, with its overall effectiveness varying as well. Flashbacks are most often used for three purposes: to jump outside the current timeline, to provide important information about a character, and to engage the audience. The first reason makes the most sense; it’s a flash-back because it is specifically designed to revert back to a point in time that has already passed. The second reason is paramount when a particular character’s background, motivations, or upbringing need to be explained. This lets us know what “compel[s] him [or her] to act the way he [or she] is now.”  Finally the third reason is a bit more esoteric. Essentially, a flashback helps to get the reader or viewer more involved with the process. Since the story isn’t “fully” known, the audience attempts to piece together the puzzle, using the flashbacks to confirm or deny their predictions and fill in any missing gaps. The major drawback to using flashbacks is their need to halt the current story in its tracks, thereby stopping the action and subsequently any of the tension that was built-up to that point. Meaning, whatever the flashback contains needs to be both purposeful and captivating in order to make up for this lost momentum. At the same time, though, there are countless types of flashbacks that exist, each of which has its own uses and merits. So even when a flashback causes a block in the storytelling, that may be its intended purpose. 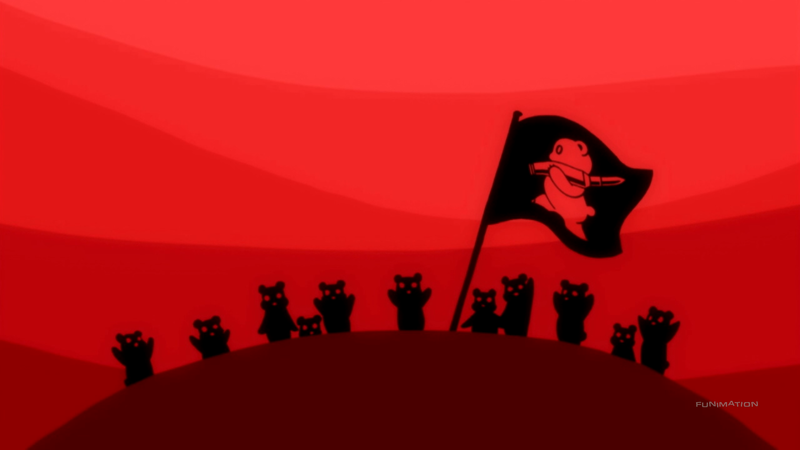 With this in mind, Yuri Kuma Arashi still uses flashbacks quite effectively. Not as masterfully as the symbolism it thrives on, but it still serves as a good example of their power and use in telling a more fulfilling tale. 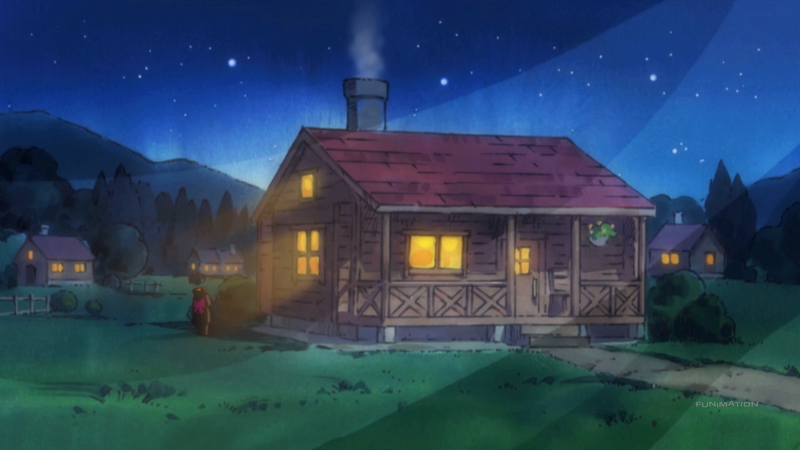 Most of the flashbacks serve wonderfully in characterizing or developing the bears and girls, their applications and forms are varied, and due to the general “stop-and-go” nature of the anime before their inclusion, their overuse fits comfortably. But there were two questions; why does Yuri Kuma Arashi use flashbacks? There are three different interpretations, ranging from low to high-level. The first is simply to be just that much more complex. By having the device used to a large degree throughout the anime, it becomes intentionally more confusing. The second is more relevant: as a means to highlight the show’s aspect of memories, remembering, and forgetting. This episode in particular dealt heavily with the use of such ideas – Ginko’s past, Kureha searching for clues to jostle her brain, and even flashbacks to events that happened within the current episode – and the notion of remembering and forgetting love has been talked about previously (and will continue to be a topic in the future). Finally, the third and most intriguing purpose, is to have theaudience do the same. The anime has thus far been alluding to a wide range of difficult subjects: love, sexual discrimination, racism, and religion, to name a few. But these topics have always been talked about and debated, with many of the same outcomes occurring regardless; “history repeats itself.” In a sense, the anime is trying to have us do something similar. That is, look back, consider the past, or otherwise think about what’s been done already; how these kinds of arguments and abuse have been around for centuries. In other words, we should flashback personally, in order to learn about the mistakes of our past in order to better our future.